Today 7 August 2013 Begin Dasha ma Vrat and contonue to ten Days. 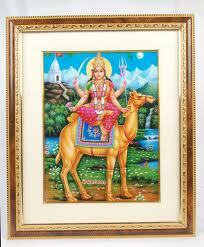 Goddess Dasha Maa is an incarnation of Mother Goddess Shakti and is mainly worshipped in Gujarat. 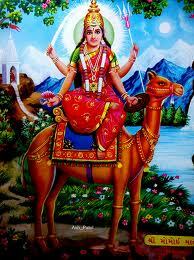 A ten days vrat dedicated to Dasha Maa is observed in the month of Shravan. Dasha Maa is one who betters the living condition. People offer worship to her for peace and prosperity in life. Worshipping her is considered highly meritorious. Dasha Maa is worshipped along with Nagbai Maa and Momai Maa. 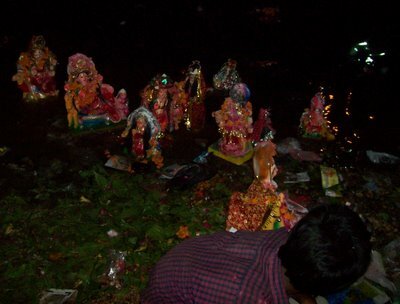 Murtis of Goddess Dasha Maa are prepared specially during Dasha Maa vrat. 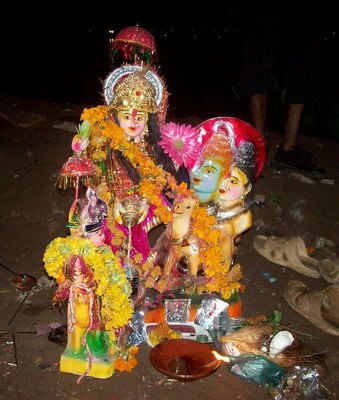 Dasha Maa Vrat is observed after Holi festival in Rajasthan. This is story When Vijay Singh was a king of kingdom in Gujarat. King Vijaysingh beautiful and kind hearted wife name was rupmati. King palace name was Jal Mahal. Jal Mahal was situated on the outskirt of his kingdom capital. So that village seen display from JAL MAHAL window. When one day village women worshipped goddess, Queen seeing them from window and surprised because women worship goddess dasha maa that type ritual never seen by queen. To know what type of ritual performed by village women queen sent her dasi ( merchant of queen ) to village. The dasi was told to queen about the holiness, power, ritual and sacrifice related with dasha maa vrata. After hearing all things queen decided to take dasha ma vrat and it is possible because that is the first day of vrat. The queen observe the vrata and followed the village women path for dasha ma vrat. The king became angry when he see queen performed vrat ritual. According to king dasha maa was the devi or goddess of poor people so that he told queen to stop that ritual and vrat. Because queen was a rich women she not need to engage in such a vrats. While the queen was busy in the vrat the king entered and got angry seeing the idol of the mother goddess Dasha Maa. He asked the queen to stop doing the vrat because Dasha Maa was the deity of poor people. Being a royal woman she need not had to be involved with such vrats. By saying this king insulted the goddess dasha maa. So that, Goddess dasha ma became angry and devastate king Vijay Singh kingdom. After ward king family became poor. Then king face lot’s off problem. One day when king entered in the fruit orchard all fruits became dry. The king also lost her two in the well. Then after when king went to his sister home and offered dry sweet to her it became stones. The King also sent to the jail by their neighbor king. After all this when king realize that he offended the goddess dasha maa and started dasha maa vrata in the jail. Then king released by jail and also got all their lost things.